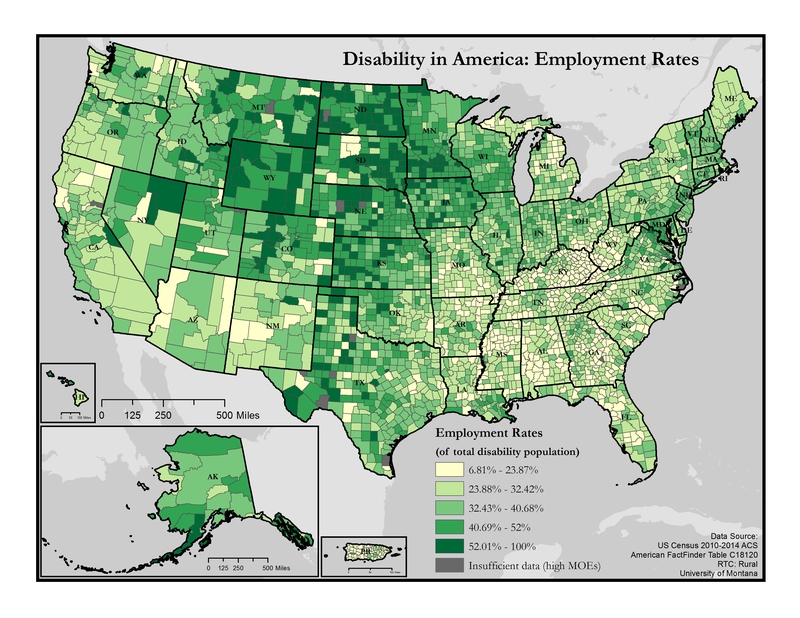 The maps below explore American Community Survey 5-year data (Table C18120) employment estimates by disability type. The ACS asks a set of disability indicator questions to determine disability. If a respondent can answer “yes” to any disability question they are classified as having a disability. The data below are for ages 18-64. In December 2018 the U.S. Census Bureau released the 2013-2017 American Community Survey summary data. 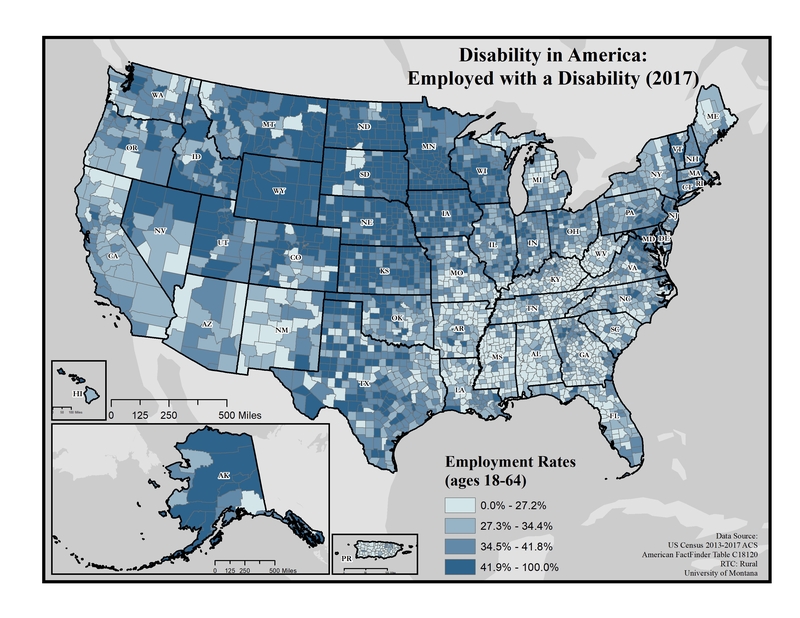 RTC:Rural researchers used this data to begin exploring how employment rates have changed for people with disabilities in the context of changing economic conditions. They found increasing disparities between people with and without disabilities across the country as well as across the rural-urban continuum. Scroll down for static, downloadable versions of the maps and text descriptions. Click on the image for a full-size, downloadable version of this map. This map of the United States shows employment rates among people with disabilities by county. The data includes people ages 18 to 64. Rates are broken into four categories ranging from 0.0 to 100.0%. Employment rates appear to be higher (41.9 to 100.0%) in Alaska, the Great Plains and Rocky Mountain areas, and in western Utah and northern Nevada. Employment rates are significantly lower (0.0 to 27.2%) in the South, Appalachia, northern Michigan, the Southwest and Puerto Rico. 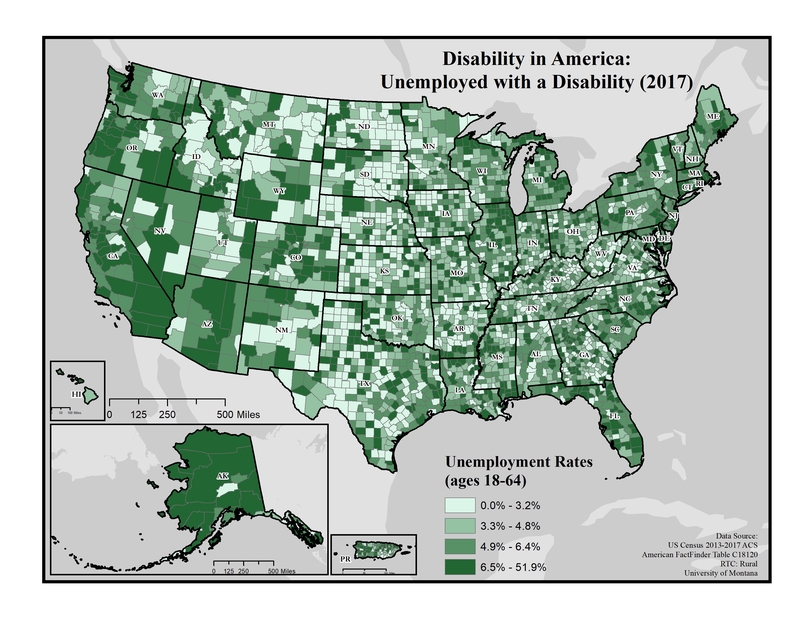 This map of the United States shows unemployment rates among people with disabilities by county. Rates are broken into four categories ranging from 0.0 to 51.9%. Unemployment rates are higher (6.5 to 51.9%) throughout much of Alaska, Oregon and California as well as across New England and the Midwest. Lower rates are found in the Great Plains but in general rates are varied throughout the country. Note: It is important to consider unemployment rates in addition to out of the labor force rates. 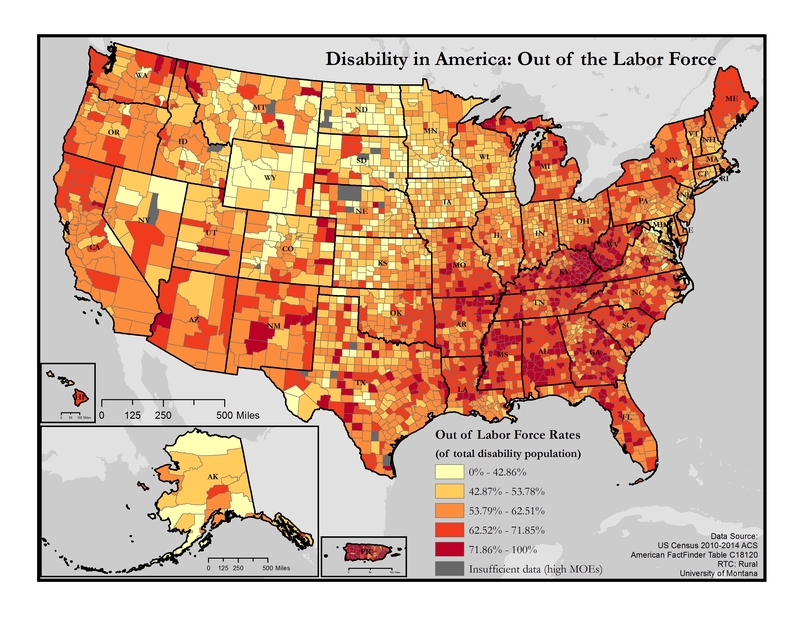 This map only shows people with disabilities who are in the labor force. See Disability in America: Out of the Labor Force with a Disability (2017) for rates of people out of the labor force. 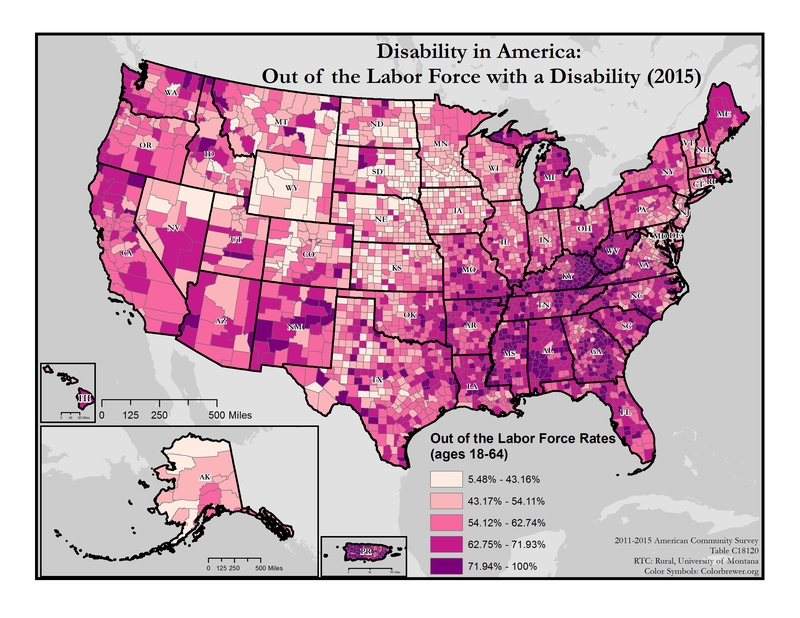 This map of the United States shows rates of people with disabilities who are out of labor force by county. The data includes people ages 18 to 64. Rates are broken down into four categories ranging from 0.0 to 100.0%. Rates of people with disabilities no longer in the labor force are extremely high (68.0 to 100%) throughout large sections of the South, especially in Kentucky, West Virginia, Mississippi, and Alabama. Rates are lower (0.0 to 52.8%) throughout the Great Plains and Rocky Mountain regions including Wyoming, North Dakota, South Dakota and Minnesota. 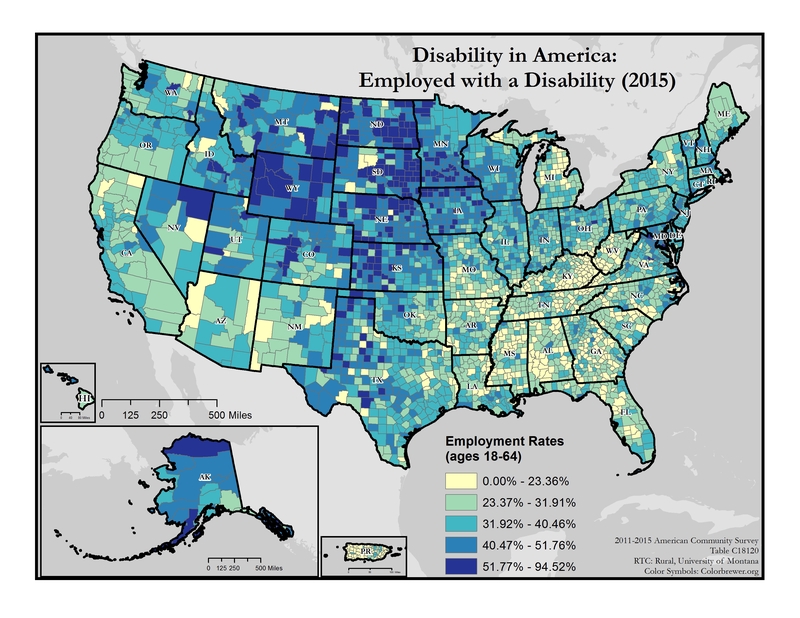 This map of the United States depicts employment rates among people with disabilities by county. Rates are broken into five categories ranging from 0.0% to 94.52%. Employment rates appear to be higher (40.47-94.52%) in Alaska, the Great Plains and Rocky Mountain areas, and western Texas. Employment rates are significantly lower (0.0-40.46%) in the South, Appalachia, northern Michigan, and the Southwest. 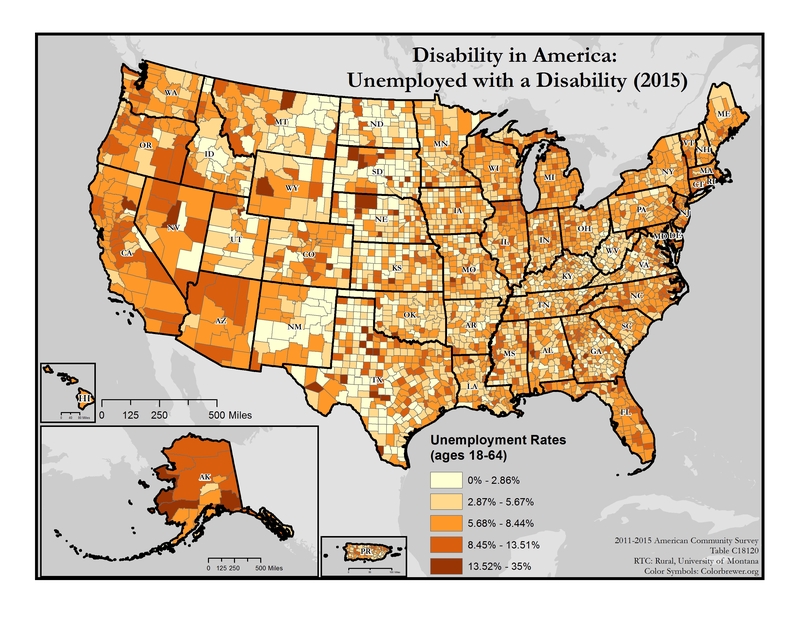 This map of the United States depicts unemployment rates among people with disabilities by county. Rates are broken into five categories ranging from 0.0% to 35%. Unemployment rates are higher (8.45-35%) throughout much of Alaska, Washington, Oregon, California, and the midwestern states and varied throughout the rest of the U.S. Note: It is important to consider unemployment rates in addition to out of the labor force rates. This map relates only to people who are in the labor force. See the map below for rates of people with disabilities who are out of the labor force. Map produced August 2017 based on 2011-2015 American Community Survey data. This map of the United States depicts rates of people with disabilities who are out of labor force, mapped by county. Rates are broken down into five categories ranging from 5.48% to 100%. 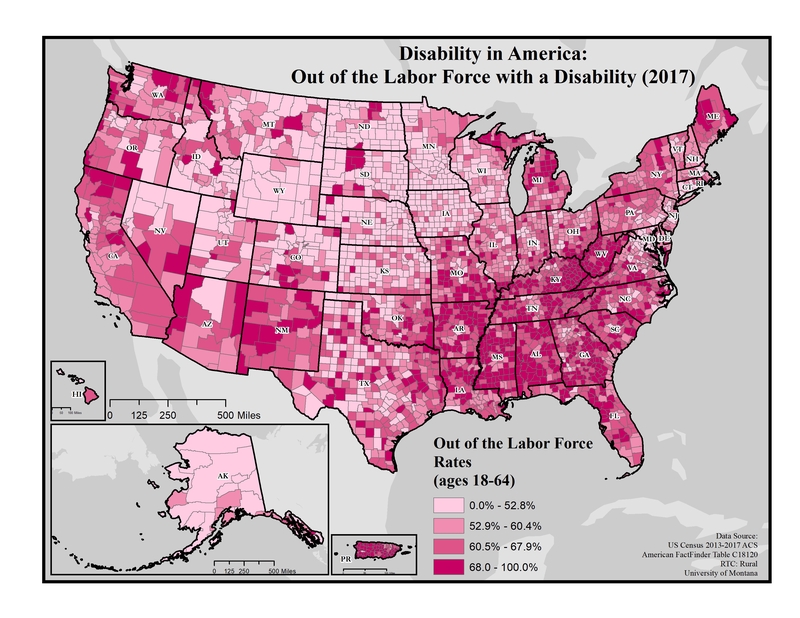 Rates of people with disabilities no longer in the labor force are extremely high (62.75-100%) throughout large sections of the South, especially in Kentucky, West Virginia, Mississippi, and Alabama. Rates are lower (5.48-54.11%) throughout the Great Plains and Rocky Mountain regions including Wyoming, North Dakota and South Dakota. Click on the image for a full size, downloadable version of this map. This map of the United States depicts employment rates among people with disabilities by county. Rates are broken into five categories ranging from 6.81% to 100%. Employment rates are predominantly higher (40.69-100%) in Alaska, and in the Great Plains and the Rocky Mountain regions including Minnesota, Iowa, North Dakota, South Dakota, Montana, Wyoming, Nebraska, Colorado, Kansas, and parts of western Oklahoma and west Texas. Employment rates are slightly lower (6.81-40.68%) along the Pacific Coast states and the New England region and significantly lower in the South. 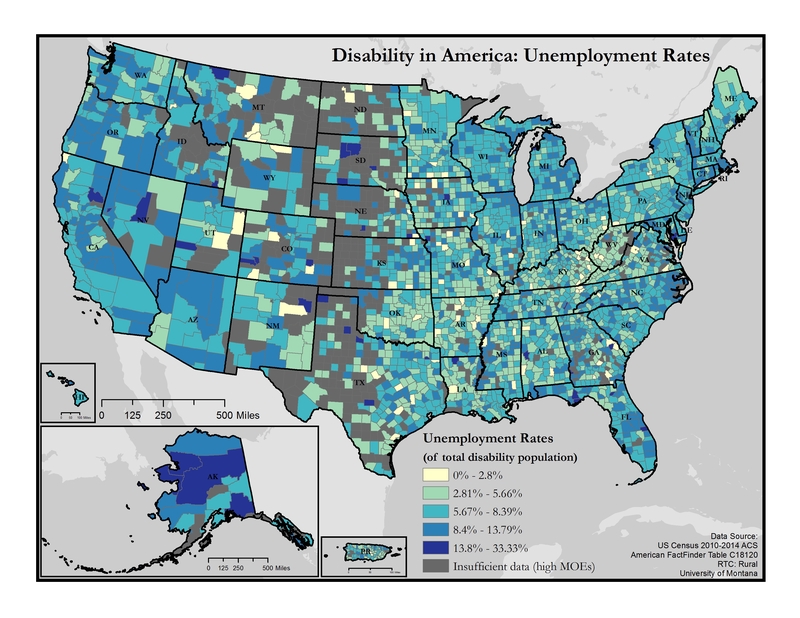 This map of the United States depicts unemployment rates among people with disabilities by county. Rates are broken into five categories ranging from 0.0% to 33.33%. Unemployment rates are higher (8.4-33.33%) throughout much of Alaska, Washington, Oregon, California, and Midwestern states and varied throughout the rest of the U.S. Note: It is important to consider unemployment rates in addition to out of the labor force rates. This map relates only to people who are in the labor force. See the map below for rates of people with disabilities who are out of the labor force. This map of the United States depicts rates of people with disabilities who are out of labor force, mapped by county. Rates are broken down into five categories ranging from 0.0% to 100%. Rates of people with disabilities no longer in the labor force are extremely high (62.52-100%) throughout large sections of the South, especially in Kentucky, West Virginia, Mississippi, and Alabama. Rates are lower (0.0-62.51%) throughout the Great Plains and Rocky Mountain regions including Wyoming, North Dakota and South Dakota.